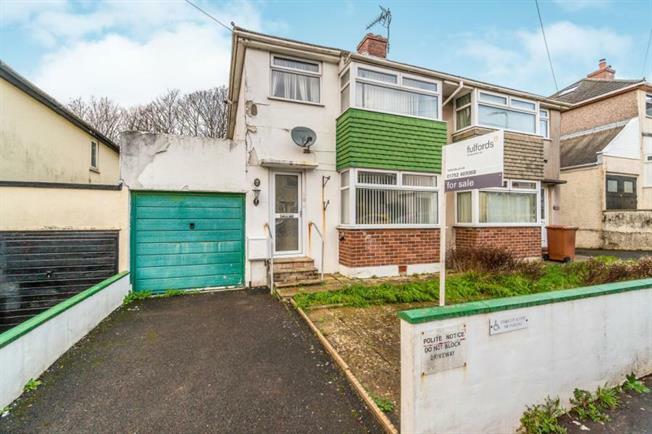 3 Bedroom Semi Detached House For Sale in Plymouth for Asking Price £175,000. Upvc Double glazed bay window to the front. Wall and ceiling lights, radiator and carpeted flooring. Upvc Double glazed window to the rear. Wall and base units complemented by roll edge worktops. Stainless steal sink and drainer. space for Washing machine, gas cooker and fridge freezer. Laminated floor, ceiling strip light. Under stair pantry. Upvc double glazed windows. Door to rear laid to lawn garden. Upvc obscure double glazed window. Bath with electric shower over. Low level W/C, wash hand basin. Tiled splash back and ceiling lights. Upvc double glazed window to the rear. Carpeted flooring. Ceiling light. Radiator. Upvc double glazed bay window. Carpeted flooring, ceiling light and raditor. Upvc double glazed window. Carpeted flooring. Ceiling light. Radiator. Laid to lawn enclosed garden area. Access to the front of this property from the side. Front garden area. Driveway parking. Steps leading up to the front of the property. Garage.